What's the most notable feature about MLB 10 The Show? I wouldn't say it's the Minnesota Twins catcher Joe Mauer, because you can't see his eyes in either of his two pictures. I'd say it's the front-and-center ESPN endorsement. 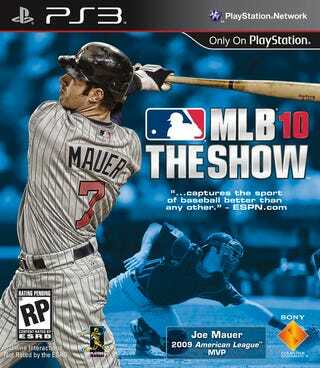 Not because it's ESPN, and not because of what it's saying - MLB 10 The Show is deservedly a great baseball game and a great video game. It's just usually the third-party accolades - which because of their annual nature, you see on sports games more - go on the back of the case. So, Sony San Diego is undoubtedly bowing up. This is a shot across the bow of not just MLB 2K10, but other sports titles too.